A former department store is to be given a revamp as part of a £1.3m regeneration project now up and running in Jedburgh. A conservation area regeneration scheme, similar to ones already launched in Selkirk and Kelso, is in operation in the town following a successful bid for funding earlier this year. The project – funded by Historic Environment Scotland, Scottish Borders Council and private-sector contributions – will oversee conservation and regeneration work in Jedburgh town centre over the next five years. The council had been working with community groups in Jedburgh to put together the proposal for years, and a bid for conservation area regeneration scheme funding was approved by Historic Environment Scotland in February. The funding now secured will enable a targeted approach to be taken towards conservation-based building repairs and will also pay for a range of training, heritage and education activities. Six properties have been identified as priority repair projects, including category-A listed Port House, in Exchange Street, owned by Jedburgh Community Trust since 2010. A traditional building repair grant scheme will also be in operation, and payouts for suitable repairs will be made in a series of rounds. Mid Berwickshire councillor Mark Rowley, the authority’s executive member for business and economic development, said: “This really is about much more than just some building work. A full-time project officer will be appointed, and a steering group will be formed including community members. In a joint statement, Jedburgh councillors Jim Brown, Scott Hamilton and Sandy Scott said: “The formal launch of this project marks the start of a five-year project which we hope will help restore and protect some of the town’s key historic buildings and revitalise the centre of what is one of the gateway towns to Scotland. Kelso’s townscape heritage initiative, part-funded by the same Historic Environment Scotland programme, won a national planning award and delivered improvements to eight priority buildings, along with repairs to more than 30 other properties. 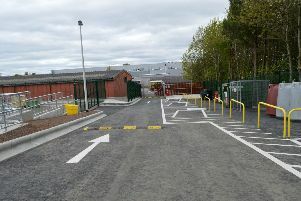 A £2m streetscape scheme was also carried out, along with the development of business space in a gap site. A similar project is ongoing in Selkirk. Port House, on the national at-risk register since 2011, was built in 1899 at a cost of £2,105 to house a local co-operative society department store opened the year after. The current 8,000sq ft building replaced a corn exchange and museum destroyed by fire in 1898. Designed by James Pearson Alison, it was one of the first steel-framed buildings in the Borders. The trust bought it for £150,000 in 2010 and has since spent a further £50,000 on making it weatherproof.